I had to go back and look to figure out what the last thing I posted was. It’s been awhile! First off, I should tell you that I finished Bug’s socks, which were to be my August pair of socks. But somehow I keep forgetting to have her put them on and get a photograph. Totally my fault! In part, I just don’t think they are all that interesting, and the color is gross. Hah! So, taking photos just isn’t high on my list of fun stuff to do. But, of course I needed a September pair of socks. 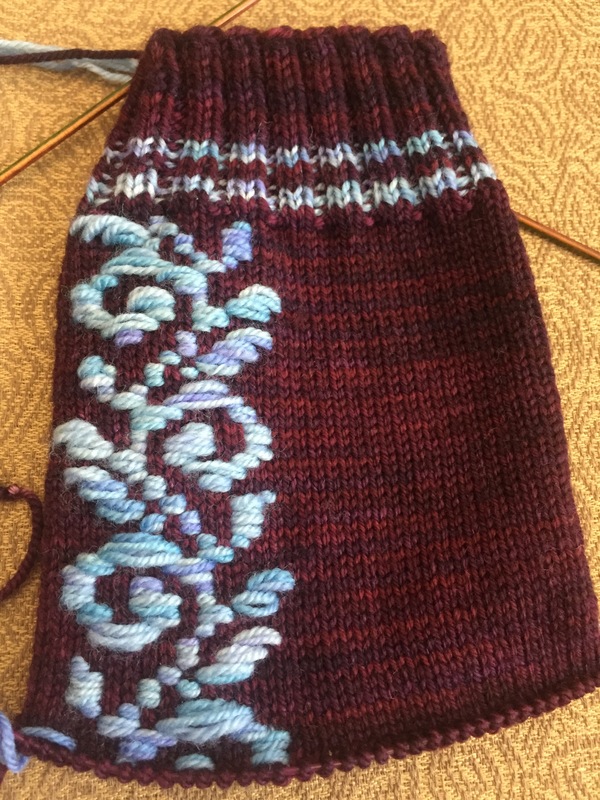 It’s taken me awhile to get to it, but at some point I saw this blog post about roositud knitting. It seems so rare now to find a technique I haven’t tried when it comes to knitting. So when I saw this and realized it had nothing at all to do with embroidery, I had to try it! I mean, how could I resist? This is the most excited I’ve been about knitting in ages. And really, how on earth could that be any more charming?! I was away this weekend on a bike camping trip. It was great fun, but I didn’t bother with pictures. There were about 50 of us in all and it was perfect weather. 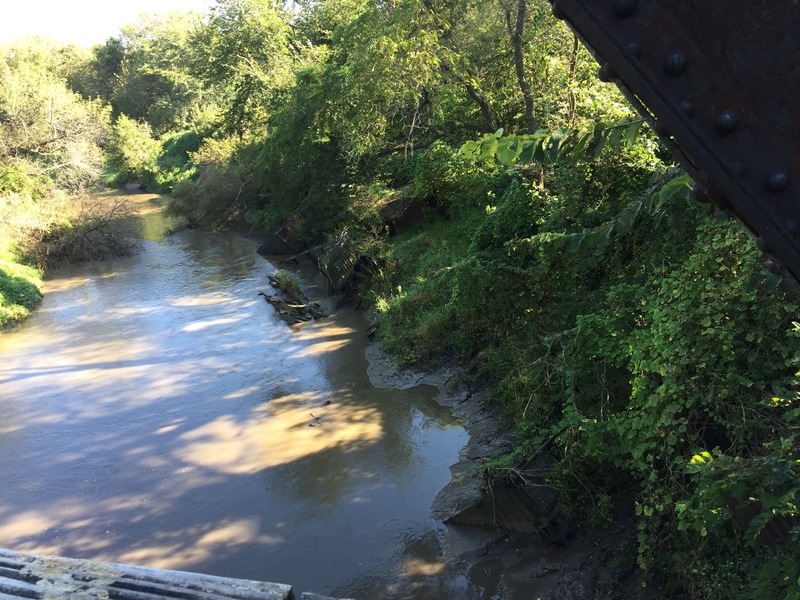 Tried to get a photo of the old train derailment at the side of the creek, but didn’t get the angle or lighting quite right. It’s appeared on this blog before though, it’s always a favorite stop for me. I guess that’s a wrap for now! Hope everyone has had a great weekend, I can’t believe it got by me with no posts whatsoever! 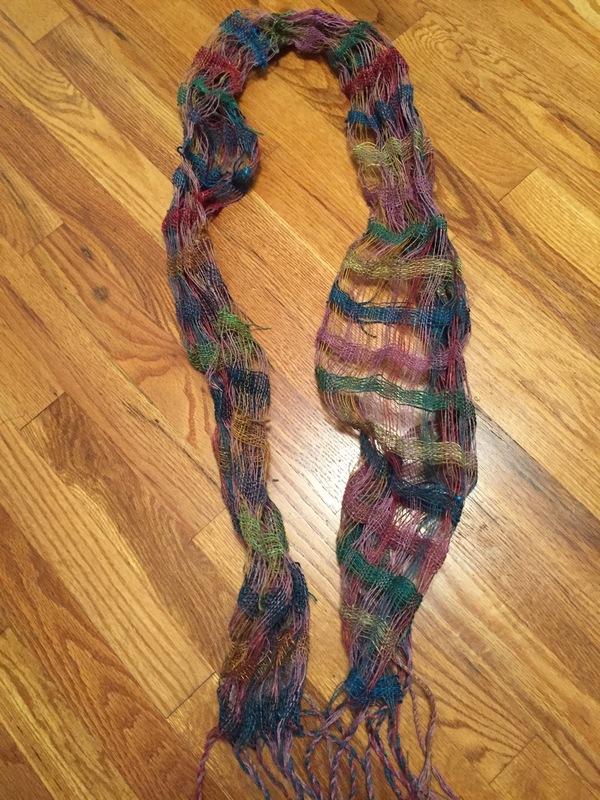 Well, it may have caused me all sorts of issues, but the scarf turned out great! I plunged it into it’s hot water bath, and it absolutely did what I wanted it to, it pulled in due to the energized singles. I did have to redo all the fringe after the hot water bath. Once all the energy showed up in the singles, it took all the twist back out of my fringe. That was interesting! This was a great project, it kept me interested and I am glad I managed to make it happen. However, I sincerely doubt I’ll do another one. 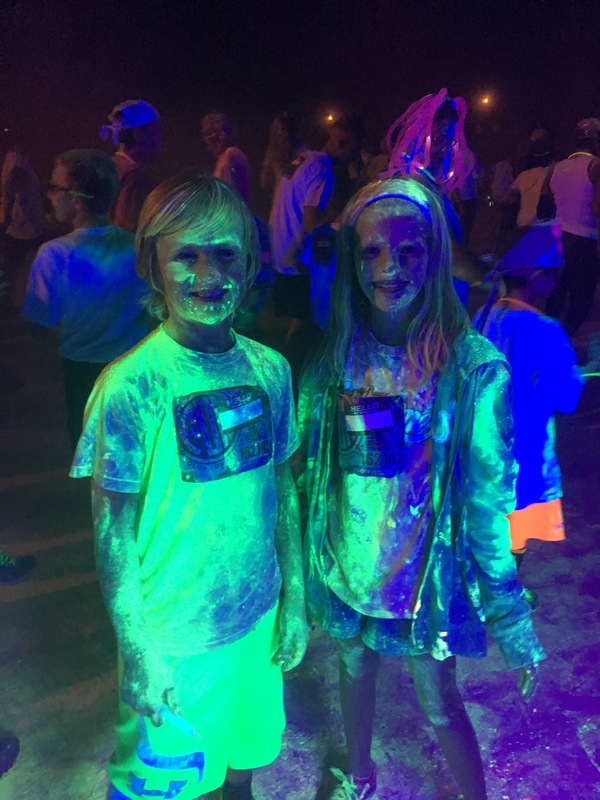 It was just…..tough. Maybe I’ll change my mind once I get better at weaving, but as of right now, I don’t see me trying this again. But it was fun! And I am pleased with the result! Last evening I sat at my loom until my project was done. I couldn’t resist this charming picture of yarn on the loom. Just layer upon layer of gorgeous color! I have learned a lot from this project thus far. In addition to the lessons I learned about sizing the warp with gelatin sizing, I also learned that if spacers are being used, you really must have all the spacers for the project. I kept reusing the original spacer, and this made the weft threads move when I was winding the loom. 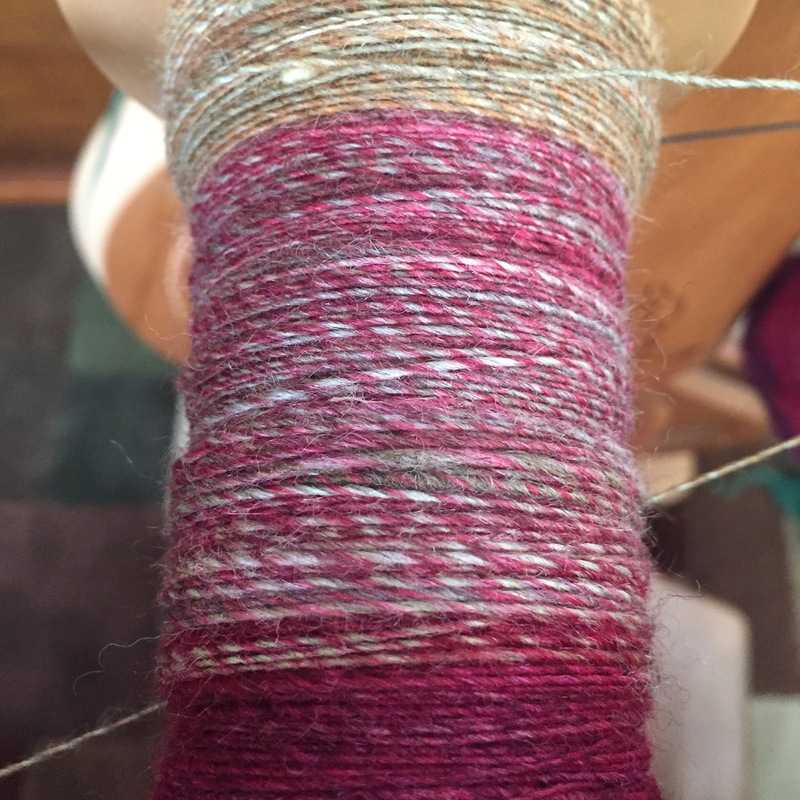 I had 3 warp threads break, but honestly that didn’t seem too bad considering that I was using very thin singles. And I managed those. 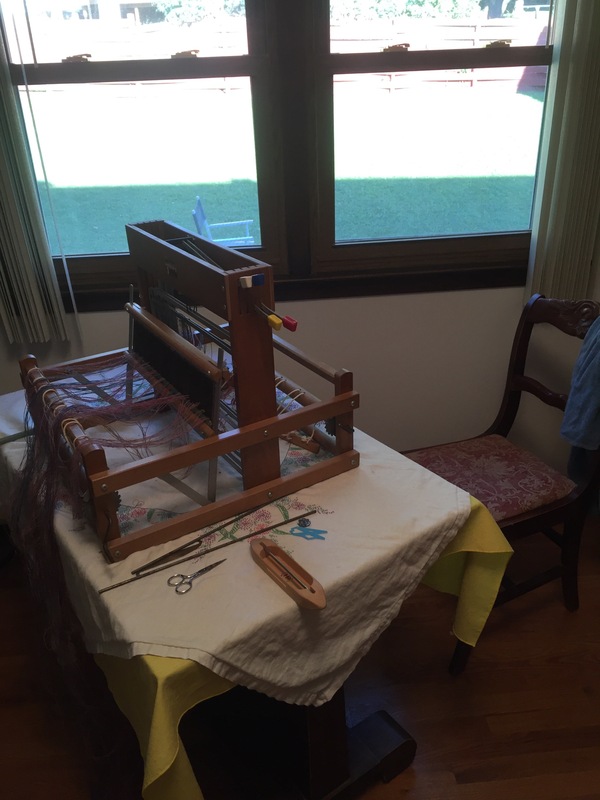 Then he left to play pool with his friend, and I sat in my loom room weaving and cursing. I finished. And pulled it off the loom. 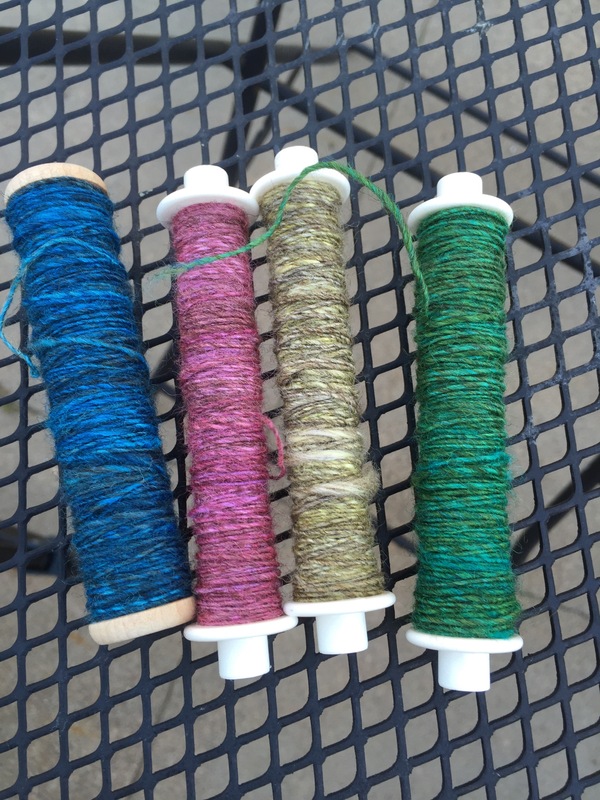 Here’s what came off the loom before it’s bath. The weft threads were not sized, so those pull in, but the warp threads still have their sizing, so they are stiff and straw like. I did put it in the bath, and here’s a spoiler alert. It looks great! I now need some decent weather so I can get photographs. But, autumn is coming in like a lion, with massive storms and high winds. And it’s dark. It’s been dark. No photographs yet! 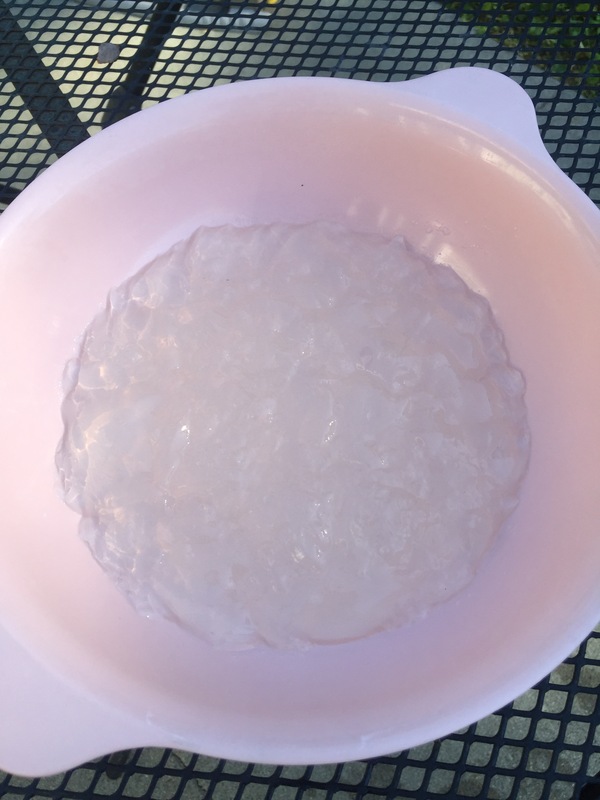 I learned a few lessons with my gelatin sizing project. #1. 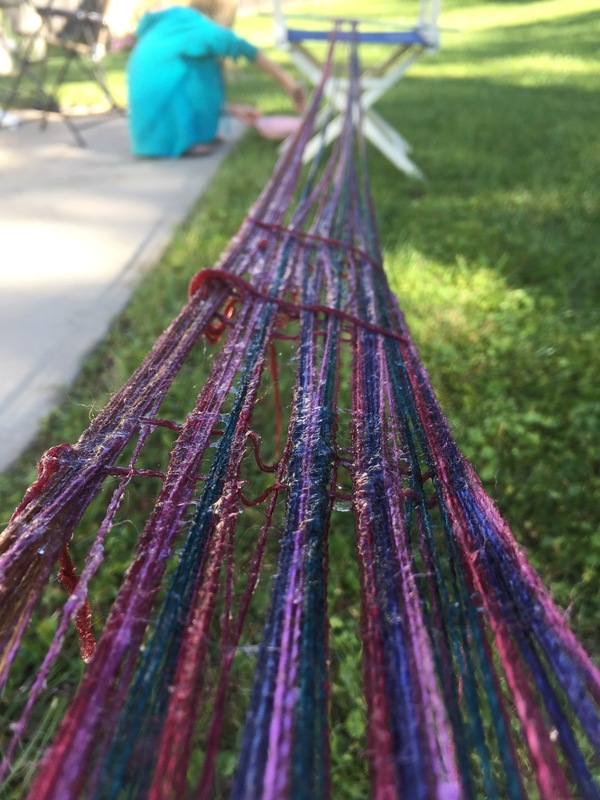 Be sure to get as much excess sizing off the warp as possible, as excess sizing makes a nasty sticky mess, and is hard on the singles. #2. Save a portion of the sizing for later use, only toss after weaving is complete. This should help you deduce what happened, but I’ll tell you anyhow. I had a nasty sticky section, and when I tried to pull it apart, I ended up breaking two of the warp threads. So, I quickly put two more on my warping board, but then didn’t have any gelatin sizing left since Miss Bug had used it all to play with. I quickly looked up other options, and noticed that some people use cheap hairspray. So, I decided that was a quick and easy option worth a try. 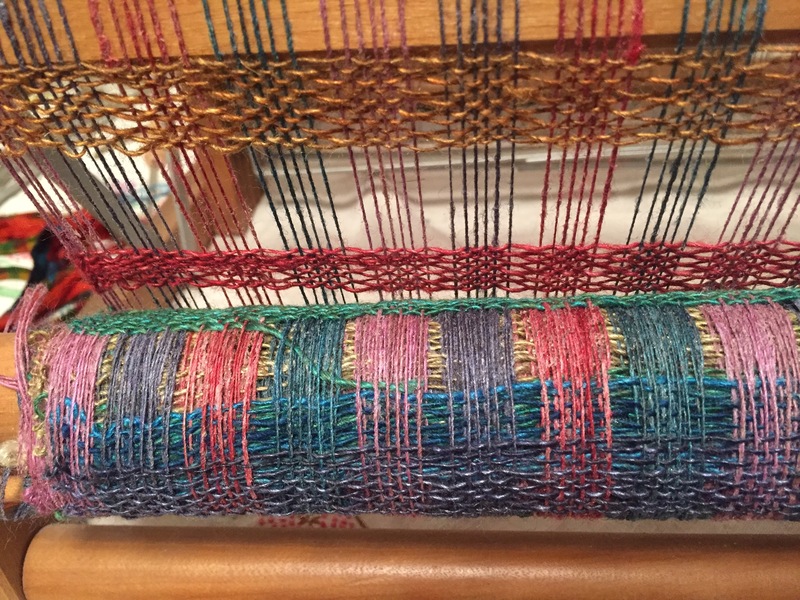 I spent part of last evening and part of today on warping the loom. 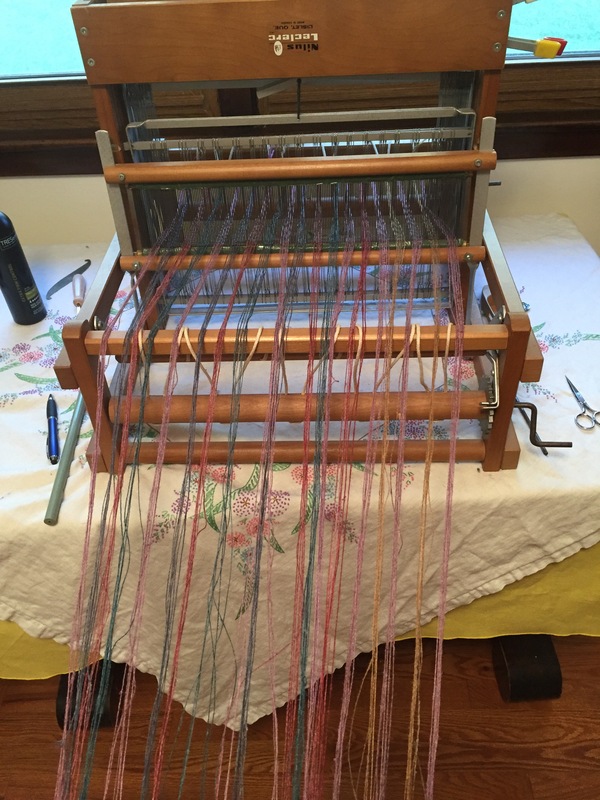 I recently made some changes in my loom room, one of the changes being removing an area rug that kept getting in my way. I now have only the hardwood floor in there, and since all the furniture is on floor protectors, it’s easy to move it around. This means I can get to the back of my loom as simply as I can get to the front of it. I just move the table around, and slip my chair back there and I am all set. I love that! I just finished tying one end of the warp to the loom. I now need to do the same with the front, but I figured I’d take a quick break. It’s looking pretty good at the moment! I also prepared some of the weft singles, getting them onto bobbins and ready to go. 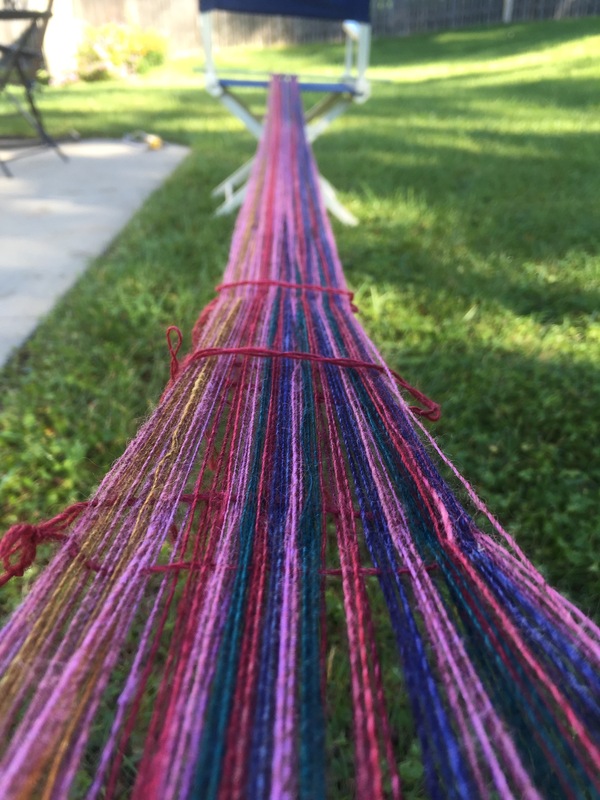 Once the warping is complete, it should all go quite quickly! Another update from the weekend, Mr. Ink decided to start customizing my motorbike. 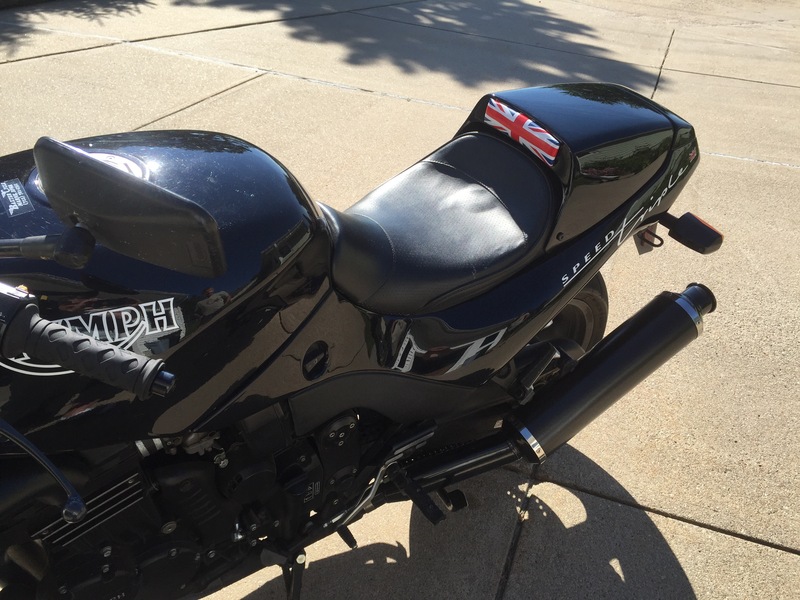 He got a seat cover for it, and then created a custom triumph logo piece for it. I think it looks great! We took a ride after he put it on the bike, and he’s decided it makes the bike go faster. 🙂 Also, he’d like me to note that this is only the beginning of the customizing of this bike. So you’ll probably see more. But, since I tend to love riding his bike more than my own, I told him he wasn’t allowed to customize this one any more until he makes the clutch easier to pull on his bike. Funny how quick that worked, he’s out in his garage right now with his bike torn apart. I hope it works! A wonderful and relaxing weekend for us all, and so entirely needed. We got tons of housework done, additional organizing and finding spots for things that need spots done, a nice dirt ride on our bicycles, it really couldn’t have been more pleasant. I could use another day or two of this! I bet you feel exactly the same. 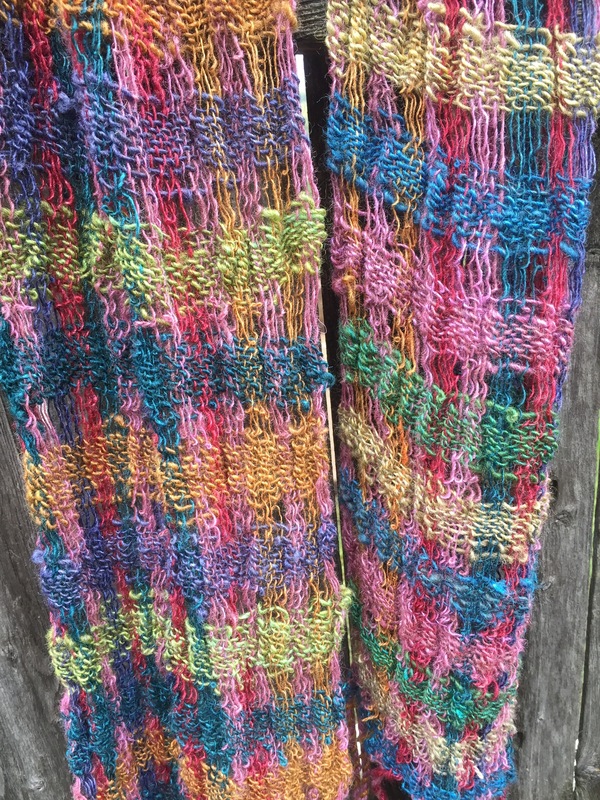 I’ve long wanted to create a collapse weave scarf out of handspun. I even spun for it awhile back, but didn’t get much further than that. With my latest wall hanging off the loom, and no specific project on my wheel, I decided it’s time to work on that collapse weave. I took all the singles I’d spun and ran them through the wheel again to add more twist. 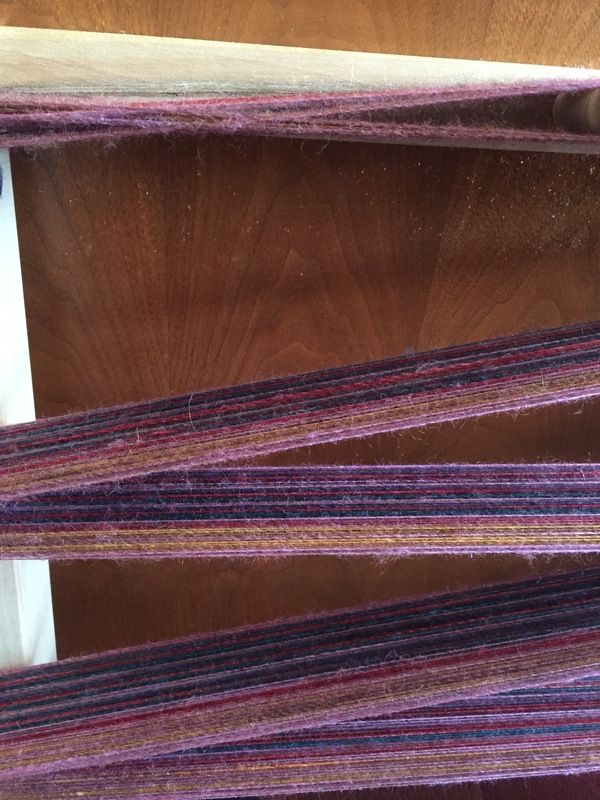 Then, I wound the yarn on my warping board. 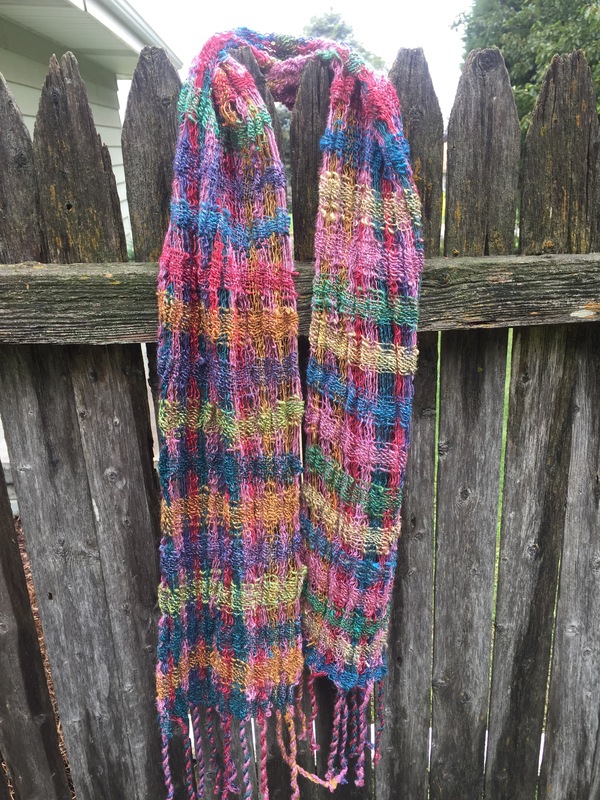 I ended up running out of singles of the colors I had started with, and then decided just to add more color. There’s no real reason not to! I am using a frabjous fibers 3 feet of sheep kit after all, I’ve got more than enough color to work with! This morning I took the singles I spun for the weft, which are slightly thicker than those for the warp, and began adding more twist to them. I am almost done, and positive I’ll finish tonight after work. This weekend I’ll have to find a way to make some sizing and put that on the warp yarn. I figured I’d wait unto the weekend so that I can do this outdoors, saving a mess inside. Stay tuned, I am pretty excited about this project and plan to update you regularly!